on January 8th, 2019 Wishing everyone all the best for a Happy Holiday Season. One Guild meeting in November is traditionally given over to learning a new Christmas Craft. This year Helen and Johanne showed us how to make simple Star decorations. - coloured paper is taped on cardboard and cardboard pieces are aligned to form a star shape. Long before synthetic dyes, Indigo (blue) dye was created in many cultures around the globe. The plants and process varied from region to region, but the result was the same - a beautiful blue. The fascination with natural Indigo dyeing still exists and there is a quiet resurrection of the process in various areas of the world. We encouraged members to bring examples of their experience with Indigo dyeing and were delighted to see the tables full of exquisite work. So many shades of blue and not enough time for all the show & tell. To be continued at Dec. 4th meeting. 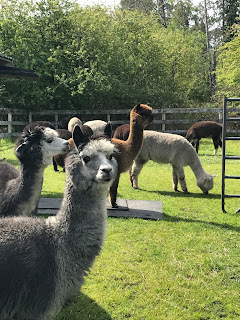 DCWS visited Inca Dinca Do Farm & Fibery in beautiful North Saanich on Vancouver Island. The Mill is owned and operated by Tracy Brennan. Our group tour leader was Brenda Nicholson, who showed us the overall mechanics of the Mill. It was a very interesting experience to see how the Mill processes raw fleece to rovings and fibre. Our tour was rounded out with a visit to see the beautiful Alpacas and JellyBean the guard Llama. Our annual display at the Sidney Museum has completed its one month showing. Overall the exhibit was well received with approximately 480 people attending. The Red Hat Society ladies were the most colourful group to tour the exhibit, proving it really is 'All About Colour'. The fall program for the Guild meetings can be found in the 'events & news' page on this site. Our next outing is a visit to Inca Dinca Do to see the beautiful Alpacas and tour the new Mill on October 23rd. We will not be holding a regular meeting at the Shoal Centre on that date. 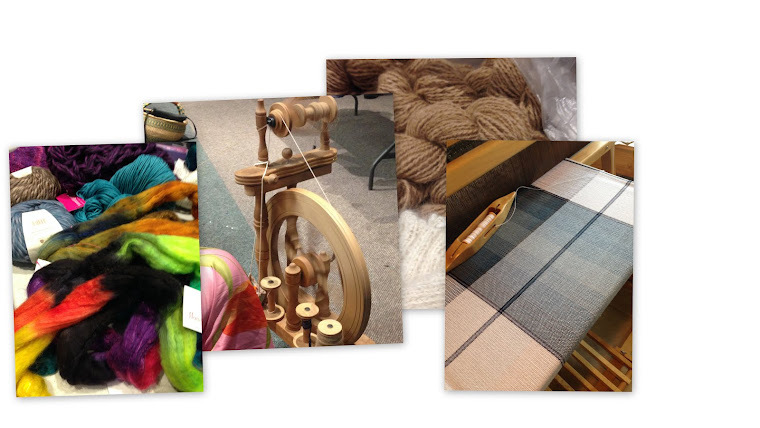 Deep Cove Weavers and Spinners are pleased to present another creative exhibition at the Sidney Museum. Sept. 17 - Oct 14. 2423 Beacon Ave., Sidney, BC This is an annual event and community outreach program for our Guild and has been ongoing since the 1990s. The front entrance holds an informative display about dyeing fibres. In addition to our displays the Weaving Wagon from ArtSea will be in the front reception area. Try your hand at some 'inspirational' simple weaving. We invite you to come by and see 'It's All About Colour'.